THE bread and bakery products market is readily available in Zambia. This is evidenced by the long queues of people filing in bakeries during peak hours. The increase in demand for bread containing wholegrain, high in fibre, or healthy biscuits and cookie items is also rising. This is so because increase in the uptake of the healthy lifestyle concepts being advised by doctors for people to avoid suffering from hypertension or diabetes or indeed for diabetic and hypertensive patients to mitigate their condition. The multi-varieties of bread, cakes and cookies, including pita bread is a demonstration that wheat, from which the products are made, is in demand. We, therefore, commend the Zambia National Service (ZNS) for its wise decision to increase its production of wheat. The ZNS has grown its first wheat crop at Lumezi unit in Lundazi district in the Eastern Province where it had predominantly cultivated maize. ZNS had already been producing wheat in Mkushi and Serenje but decided to include Lumezi on the list of its units growing the crop. ZNS has mechanised its wheat farming at Lumezi where it has deployed two centre pivots on its 120 hectares where it is expected to reap about 12,000 bags weighing 50 kilogrammes each. Mechanisation at Lumezi has enabled farming of wheat to become much less labour-intensive as opposed to the maize which was being grown manually. By growing wheat, the ZNS is walking the talk in supporting Government’s quest to diversify the economy. Thus, ZNS has taken a lead in prioritising agriculture by growing diverse crops and keeping animals. This has in turn contributed to the country’s national food and nutritional security. ZNS has been working hard in researching which areas of the country are best suited for certain kind of crops. That is why President Lungu has commended ZNS for the unprecedented production of wheat and significant contribution to agriculture and infrastructure development. 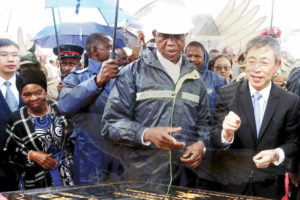 President Lungu said yesterday that the remarkable achievement cannot go unnoticed as it has been his Government’s priority to make agriculture the driver of our economy, shifting the country’s focus from mining, which has been the main stay of our economy. 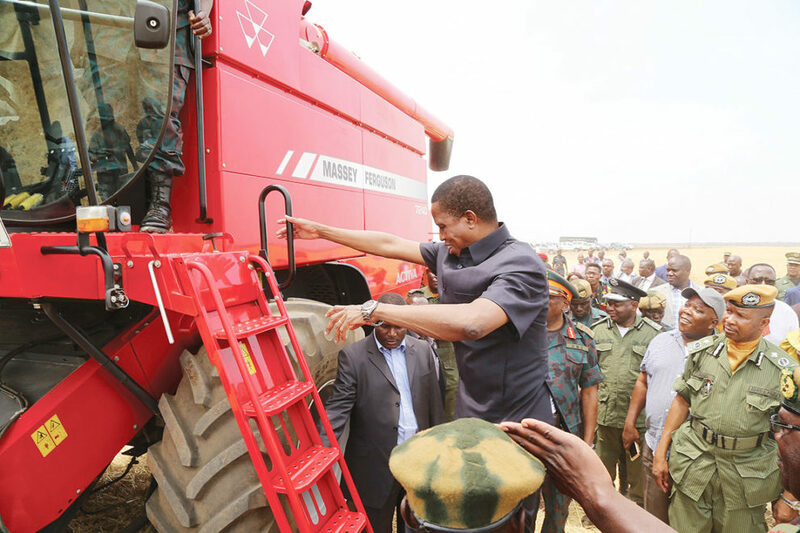 When he launched the inaugural wheat harvest, President Lungu urged the Zambia Army, Zambia Air Force and the Zambia Police Service to emulate the ZNS’s drive in contributing to national food security. Zambia grows about 300,000 metric tonnes on average while consumption is around 233,000 metric tonnes annually. Between 2012 and 2015, there was a fluctuation in wheat production due to inadequate electricity supply. The country, meanwhile, exports between 40,000 and 50,000 metric tonnes of the cereal. Most of the wheat is grown in Mkushi, Chisamba, Mazabuka, Lufwanyama, with Lundazi becoming the latest district. Farmers, including ZNS as an institution, have started harvesting the wheat and the outlook is promising. We hope that with ZNS coming on board, the prices of wheat and its products will stabilise and make Zambia self-sufficient in the crop.